Pixar’s newest movie, Brave, is about a princess who turns her mother into a bear. I have a problem with Pixar, and in reviewing Brave, I would like to get up on a soapbox for a bit and explain that problem. Many people really like Pixar movies, and think they are the best thing to happen to animation since Snow White and the Seven Dwarfs, but I still have my problem. That said, Brave deserves to be judged on its merits as a movie first, an animated movie second, and as a Pixar movie last of all. The story of Brave is so predictable, I predicted it. This despite the fact that Pixar went out of its way to avoid giving away what the movie was about. Essentially, it is a remake of every Disney princess movie ever, except with Brother Bear’s plot twist. Pixar apparently thought we would forget there had already been an admittedly forgettable movie about bear transformations this century. Joke’s on you, Pixar. This is a furry site. Remembering forgettable anthropomorphic animal movies is what we do. There is a princess, Merida (Kelly Macdonald), and she does not want to marry her suitors, and cannot convince her overbearing (get it? Get it?) mother (Emma Thompson) to let her shoot arrows her entire life. Shooting arrows is kind of her thing, you see. Eventually, she meets a witch with a bear fetish (Julie Walters), who agrees to cast a spell on her mother that will change her. Merida thinks change her mind about the marriage thing, but the witch has that bear fetish, so that does not go as planned. Unfortunately for mother and daughter, father (Billy Connolly) also has a bear fetish, though only for killing them. This is a kid’s movie, after all. Also, though the queen bear is usually intelligent, she occasionally lapses into full on bear mode, though this only happens twice; once to prove it can happen, and once to needlessly extend the third act. The pair discover that they have two days to change mom back; you will have to watch the movie to see if the two reconcile their differences and team together to break the curse. That, or just guess. Good guess. There are also three mute younger brothers who are caught in the magical crossfire and turned into bears. They are the best part of the movie, because they actually act like cartoon characters. There is a pretty funny bit where they use shadow puppets to herd the grownups outdoors. At one point, one dives headfirst into a lady’s cleavage. Wait, wasn’t this supposed to be the feminist Pixar movie? 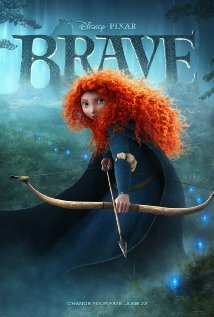 My final thought on Brave is that it, like most Pixar movies, could use a bit more animation. Let me explain. I have never bought into the Pixar perfection. They make movies like, well, cars on an assembly line. It doesn’t matter who is in the director’s chair. A Pixar movie is a Pixar movie. And I have always found Pixar movies very sterile. Studio head John Lasseter has gone on record saying he does not like “quirkiness,” which is to me the problem. You make cartoons, man! Cartoons are a pile of quirks brought to life. When you forget that, you make really weird art films about rats, robots and balloons and forgettable movies about princesses and bears, instead of great cartoons. In short, Pixar is boring. That is my problem with them. I'd be more likely to consider this opinion if it read more like a professional review and less like a hastily typed forum post. Please edit this. My favorite Pixar movie by far is The Incredibles; my favorite Quentin Tarantino movie by a country mile is Jackie Brown; in other words, my favorite Pixar and Tarantino movies are those movies that are least like their usual styles. Well, for one.. Princess movies are a genre. They typically follow the way their original stories were written x-hundred years ago. There's always a handsome prince riding off with the girl at the end when they kiss at their wedding. Cowboy movies always end with the gunslinger riding off in the sunset. Furry movies... uh.. never get finished. Secondly, you seriously consider all Pixar animations to be boring? Not all cartoons are Looney Tunes. I would not be surprised if you were one of those kids that say NES has horrible games because the graphics are primitive. Just sayin'. I'm not spiteful, I'm Katty! One of the few times I've seen a story being hidden due to it's rating. I don't think it deserved a 1 but it's not the best review ever. I guess there are a lot of Pixar fanbears here or something. PS: How cool would it be if Pixar release a low-res pixel art movie? That's because I always automatically five star faders, except my own, because that's cheating. I cant believe I expected to read an intelligent article on a furry website. This article starts to make good points but ends abruptly and without making any good points. Which is upsetting because I do agree with the sentiment . I have never been a fan of Pixar... sure there are Pixar movies I enjoy but overall its been more about profit than story and character development. Disney and Pixar know that whatever Pixar crap they release...kids and their parents will pay to see itand pay for all the merchandise that goes with it. That's why 3D animation is a gold mine because its more puppetry than actual animation which makes it easy to crank out new movies and subsequently the sequels that follow. So Disney has learned to use this easy to animate' technologyand gave the heave hoe to 2D animation and with it...any hope of decent story lines or memorable characters. I did enjoyed Brave... but I agree it left a lot to be desired. I thought the King was hilarious but everyone else was kind of meh. The whole movie was Brother Bear (great movie) meets how to train your dragon (not pixar...also a good movie). The one kid who you couldn't understand at all looked exactly like fish legs from HTTYD.... this drove me NUTS. It feels like they just borrowed this 'puppet' and gave him a different voice. The plot was also predictable as you mentionedwhch is fine when done right. This movie spent so much time "getting into it" that they had to.rush the ending. But overall it was still a good way to waste an hour and a half on an otherwise boring Saturday night. I have zero expectations going into a pixar movie so when it entertains me in anyway, I'm happy. I really don't understand why you think cartoons have to be "quirky" (and what do you mean by quirky anyway?). It sounds like you also think all animation = cartoons. Animation is a medium, not a genre. You can make anything you want with animation, from Tom & Jerry to Jin-Roh. If you prefer quirky cartoons, okay then, but don't invalidate all other the great movies and shows that just happen to be animated. Unfortunately I'm gonna have to say this review came off as biased, and not in a good way. Surely there are many who dislike Pixar as a company for what it had done to Disney as a company and the animation genre, taking away the craft of human art from animation. The thing is, a review for a particular movie is not the time to bring out these transgressions. My biggest criticism of most Pixar movies is how similar they are to one another with exception of the Incredibles. Lets take Bolt, Finding Nemo, the Original Toy Story and Cars. Bolt is about a Dog who thinks he's a superhero with powers when he really isn't, Toy Story has Buzz Lightyear who thinks he's a hero when he's just a toy. All four movies have the protagonist get lost in some way shape or matter and have to find their way to their goal/home through some side track obstacle and on the way find out something about themselves. Then again all these from all these movies find roots from Homer's the Odyssey. Unfortunately since "Princess and the Frog" bombed in the box office, mostly due to crappy advertising which oversimplified the plot (because I would have been MORE interested in the story if I knew the girl wasn't a real princess as the commercial had you believe), traditional animation is going to probably not see the light of day in Disney movies for awhile, if ever. Ah, then my bad. Guess all these computer generated films start to blend in. Well, I did have a bit where I mentioned Pixar was the standout at the beginning o last decade, mostly because animation was pretty lousy then. Now, they're blind adoration by people who really should know better grates on my nerves. You remember why I hate "Ratatouille"? Someone hates Ratatouille? The movie is awesome, and so is the side dish it was named for! Ratatouille was okay until the critic's speech and I realized why critics loved the movie. Once again, I'm probably madder at the critics for falling for it; the filmmakers may have been genuine, but it feels wrong. You think critics were really swayed simply by a monologue of a character who happened to hold a similar job title? I'm sure there are worse things that movie critics have been bribed with in the past. You know, things more physical then words, like free gifts and money. I think it still would have gotten good reviews, but a movie with a problematic premise ad a notably trobled production history as best reviewed wide release of the year? Right pixar movies are about making money only that is why Pixar and Disney had to tell off toy companies bitching to disney about them being unable to make profitable toys of Up, why they went through the trouble to authenticate the cook wear in Ratatouille, or the social commentary relating to Wall-E. With the exception of Cars continued existence for it's marketability, pixar so far has been the only company taking the high ground focusing on original stories that are not adaptations or low grade sequels that run a franchise in the ground like Happy Feet 2 or the Ice Age sequels. And I don't understand the attitude of "if it's a cartoon, it should be slap stick and goofy-ness. Put the the pigeon holing of animation out of your mind, you're talking about cliche's lets talk about the cliche of making animated films strictly for kids or the broad all ages audience. This guy right here, I like this guy. Personally, I think that Pixar does a great job with these movies not because they have outstanding plot (they are rather predictable, but so are a number of movies and TV shows), but because they are able to tell a story that you were expecting, but manage to keep you engaged the entire time. Also, there's this certain feeling I get when watching them. I'm beginning to wonder if I actually get high off of Pixar moves. Cars was my only exception. And for Brave specifically… I'm a ginger so I probably would have liked it no matter what. Yeah, it was disturbing how even other negative reviews started drooling about her hair. I mean, actually, yes pretty hair, but her face is down there, guys. Heh heh. I don't know, the thing is, somehow Pixar movies always seem to have the right message at the right time for me. I was actually dealing with the same kind of issues with my dad just a few days before that. He's the boss of our family business (mobile laser tag), and I was talking about how I would like to start looking for a bigger job, and then the events of Brave unfolded but without resolution. I probably could have put it better, but because of the way he is, there isn't much that will mend the bond except time. Whoops, forgot the 3D disclaimer! Review was based off 2D screening! It's the stuff I like best about Pixar's movies. They don't do enough of it. Wall-E was 1/2 my favorite Pixar movie. I got bored with WALL*E after about the thousandth space loop-the-loop. Stunningly beautiful and maybe even romantic if yo're into robots that way, bur not what was advertised. Maybe its their marketing deparment I don't like. I'm a few weeks removed from seeing the movie, which usually gives me some time to assess how I feel. While this may have been the first Pixar movie to really move in on the whole Disney-esque princess, singing thing, I also believe this may have been the most Miyazaki-like Pixar flick yet. You have the strong leading female character who is fighting for her own destiny. I thought the witch and her familiar added the "quirkiness" you sought. My problem with it is the theme and ending. To have someone "choose their fate" implies that there are consequences to that decision. There were no adverse consequences by the end of this movie. That's why it seemed just a bit hollow to me. Yeah, the witch did seem out of place; I mean, there was one joke about the potion answering service that read like somebody found it in a DreamWork's writer or storyboardist's wastepaper basket. I kind of seem to have repressed that whole section of the movie actually. That is the thing about quirky; there is bad quirky, admittedly. Whoopee! I just saw Brave today. I enjoyed it thoroughly. I agree with most of the criticism. (1) Yes, the human-into-bear plot screams Disney's Brother Bear. So what? How many totally original plots are there in movies? Pixar has had a longer run of originality than anyone expected. At least they haven't claimed "this is our own totally original idea that nobody has ever done before", like Disney did with The Lion King. * And they picked a theme that hasn't been done to death, which is why everyone has locked onto Brother Bear. Not that many human-into-bear transformation movies out there. (2) It is Pixar's first movie with a strong female lead. (Not counting Elastigirl in The Incredibles, and she shared the lead with Mr. Incredible.) Of course Disney has had a lot of movies with strong female leads, as have other studios. At least Brave features a daughter-mother rivalry. Most strong female leads are orphans or at least motherless. (3) All the men in Brave are idiots. Actually, it could be argued that everyone in Brave is an idiot. Certainly Maudie the maid and her staff are as idiotic as any of the men, and Queen Elinor is totally oblivious to the obviousness that Princess Merida is just not going to abide by any of her "a princess does not ..." rules when Elinor is not around to enforce them any longer. Actually again, this struck me as a serious anachronism; Elinor is insisting on 12th or 13th-century standards of court etiquette in a vaguely 9th- or 10th-century Scottish laird's court. Merida is an idiot for her willful refusal to recognize the realities of her position. As a king's only daughter, she is going to be thrust sooner or later into having to accept some political responsibility whether she wants it or not. She is the only one who has a reasonable excuse; she is a teenager who is naturally self-centered. The Witch is off in a world of her own. Brave is Pixar's first movie in which the story advances because everyone acts like an idiot. It will be too bad if this is the first of many. (4) The graphics are simply awesome. Pixar has outdone itself. Aside from being beautiful and beautifully detailed, it feels real. I briefly visited the Scottish highlands in 1991, and I can personally attest that moss and lichen cover everything; there are drifting fogbanks all over; and I saw a ruined castle (from the outside) just like the one that Merida discovers the giant bear Mor'du in. It was posted with a Scottish government sign that said basically, "You are warned not to go into these ruins. They are unsafe and very dangerous. Explore at your own risk; the government does not accept any responsibility for your safety." (5) The Witch is the real jarring note in the movie. She is a figure of deliberate slapstick humor, full of in-your-face anachronisms, totally different from all the other characters. Were the Pixar writers afraid that a realistic/scary witch would be too much for audiences? Fortunately, she only appears briefly. (6) The ending feels phony. Merida, who spends the whole movie arguing for the right to live her own life without the inherited responsibilities of King Fergus' kingdom, apparently convinces her parents to agree that she should be "allowed to gallop free into the forest, her hair flowing in the wind, shooting arrows into the distance" (or whatever the line is). Sure, and how long will that last in a 10th-century Scotland rife with clan politics? Merida appears to have learned nothing, making Brave a true Disney Princess movie with a "happily ever after" ending. *I attended a press preview screening of Don Bluth's All Dogs Go to Heaven in 1989. Right after the screening, Bluth exec Gary Goldman gave a pep talk about how no other animated feature had ever been set in 1930s New Orleans; they had researched the location and period thoroughly to make sure that their background was scrupulously accurate, etc, etc, etc. After his speech, one of the invited guests said that she hadn't planned to say anything, but after being told at length about how accurate their 1930s New Orleans was, what about the scene where somebody phones out for pizza? They didn't have take-out pizza in the 1930's. Goldman immediately blathered about, oh, well, it's only a cartoon, it's full of fantasy about talking dogs and singing alligators, it's for kids and they'll never notice a little detail like that. Yeah. I just kind of knew it, all along, somehow, didn't I?